OLEMA, Calif. — Imagine a blue sky abruptly engulfed by black smoke. Trains which have fallen off of their tracks lay motionless and farms and homes appear ruined and out of place — all in the matter of seconds. At 5:12 a.m., on April 18, 1906, the earth shook, offsetting California roads, fences and trees by several yards and causing displacement along 350 miles of the San Andreas Fault. “You try to get up but get thrown to the floor by the seismic waves but eventually you do and 45 seconds after all of the shaking begins, things start quieting down and in the morning twilight you might’ve looked up to east and thought, ‘Things over there seem a bit further to the south than I remember them the night before,’” Chris Lish, Point Reyes National Seashore Ranger and tour guide, said. 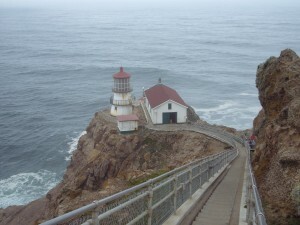 At right, the Point Reyes lighthouse. 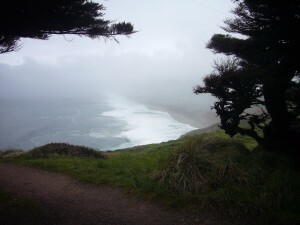 Below, the Pacific Coast looking north at Point Reyes. (Staff photo). Today, those who visit the Bear Valley Visitor Center at Point Reyes can walk the 0.6 mile Earthquake Trail and receive a ranger-led tour along a portion of the famous rift. For an hour, visitors become amateur geologists on a quest to use their surroundings to better understand the history and geology of the complex area. The peninsula, located approximately 30 miles north of San Francisco, is a popular destination for residents from the Bay area as well as for out of state visitors. 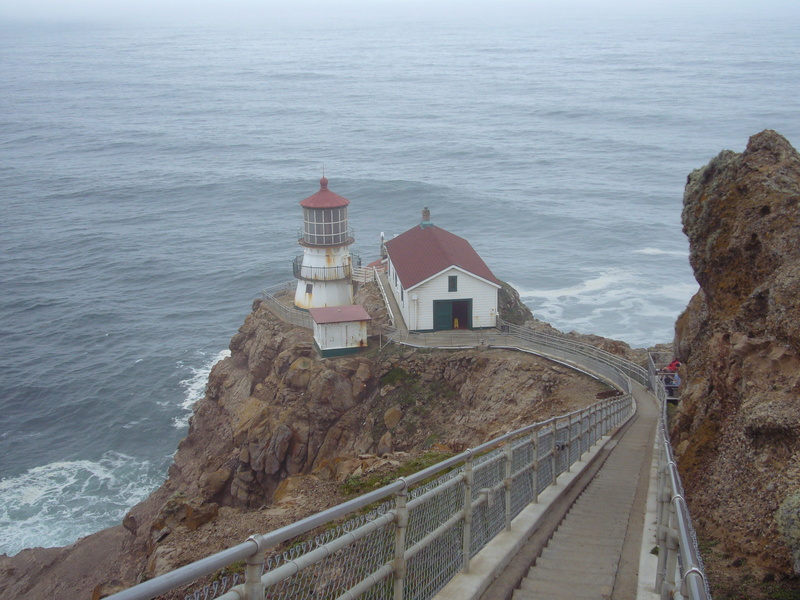 People visit Point Reyes for many reasons: the natural beaches, exciting wildlife, endless trails and its distinct historic and geological make-up. In fact, Lish considers Point Reyes, along with the other 390 National Park Service sites, one of the world’s best geology classrooms. The adventure begins with examination of a geologic map of Point Reyes. Guests identify attention-grabbing features of the map such as the narrow odd shape of the peninsula, beautiful Tamales Bay, and the various hills and ridges that distinguish Point Reyes. What makes this even more unusual is the extremely rocky terrain located further south of the peninsula. As the tour progresses, visitors learn about the cause of such unusual formations— wave action. “Most of the waves come in and break against the shore from the northwest and create this fairly straight beach and without any rocky outcrops you aren’t going to have any rocky points sticking out at the middle of the beach,” Lish explained. Together, Lish and the group make sense of the reason for such rocky terrain at the southern end of Point Reyes. “This is due to incoming waves from the south during the winter storms. Those waves are much bigger and they erode away more quickly,” Lish concluded as he passed around a photo of the peninsula. “The photos really help me to visualize what Chris is saying, especially since I do not know much about geology,” Tim Wald, who was visiting the park from San Francisco, said. As visitors continue along the trail they come across two peculiar fences, separated by several yards of open space. The ground near the area is rough and unbalanced. It is the same ground that was displaced during the violent earthquake over 100 years ago. “On the morning of April 18, 1906, at 5:12 a.m., these two sections of fence would’ve been connected and then a minute later you would’ve had 16 feet of displacement,” Lish explained. Though it is believed to have only lasted 45 seconds, the 1906 earthquake has had an everlasting impact on history and geology. Visitors learn about Andrew C. Lawson, who discovered the San Andreas Fault and about plate tectonic theory, which explains the reason for land movement. In the case of the San Andreas Fault, the Pacific and North American plates engage in transform movement where the plates slide passed one another. “I am learning so much about geology and the best part is I am not learning it from a boring textbook,” said Mary Amant, a visitor from Virginia. That is exactly what makes the “On Shaky Ground” tour so attractive to guests. The interactive tour engages visitors and makes them part of the lesson. Whether Lish asks the visitors to name a national park near their hometowns or to think about whether an area’s vegetation can reveal something about the rocks underneath them, his questions help keep his listeners engaged. “I like the fact that Chris asks us questions to try to really connect us to geology,” Amant said. Not only do they learn about the geological make up of Point Reyes, they also learn how that very underlying geology of the area affected the extent of devastation during the earthquake. “Most of the damage we witness after these earthquakes does occur where there is a lot of mud and fill or structures built on mud and fill like in the Marina District or the Cyprus structure over near Oakland,” Lish said. On the other hand, development in areas with granite bedrock experienced the least movement. Point Reyes, located on the Pacific Plate, moves northwest about two inches a year and geologists have reason to believe that a major earthquake will happen soon. Lish reaffirmed these predictions and assured the tour group of the imminent threat of a major earthquake in the future. In fact, he dedicated the final portion of his tour to emergency earthquake procedures. “If you are outdoors try to move away from trees and power poles and if you are indoors, try to get under something that might protect you from falling debris,” Lish told the group. He also recommended that people try to use a landline phone to contact someone from outside of the effected area due to the unreliability of cell phones in times of widespread emergency. Despite the invention of the seismograph, which helps geologists determine when and where the next big earthquake will hit, no one can ever be one hundred percent sure of when the pressure along a fault will reach its breaking point. One thing we can be sure of, at least according to Lish, is that another major earthquake will shake San Francisco some time in the near future. “On Shaky Ground” tours are given every Saturday at 2 p.m. and last about an hour. To learn more about earthquake science visit, http://www2.nature.nps.gov/geology/tour/.